The Cliffs of Moher in County Clare are justifiably one of Ireland’s most popular natural tourist attractions. These cliffs are battered by Atlantic rollers and the top (and bravest) surfers come here to ride the waves. I’ve never seen the cliffs from sea level but I am sure they are pretty impressive and daunting when riding a wave in. Looking from above the scene is spectacular, as these tourists are finding out. My mother was born in Sligo and spent a lot of time here. She was always torn between Cliffs of Moher and Donegal as her favorite place. She loved seeing the pic above! Love this! When I visited Ireland a few years ago, the day we came to the Cliffs of Moher was so foggy that I felt sure I would just walk off the cliffs, unable to see the edge. Thankfully I didn’t fall, and thankfully, through this shot, I see the edge. I love lying on cliff edges and looking down, love it – the feeling, you know. I think I once was there when I was a child. 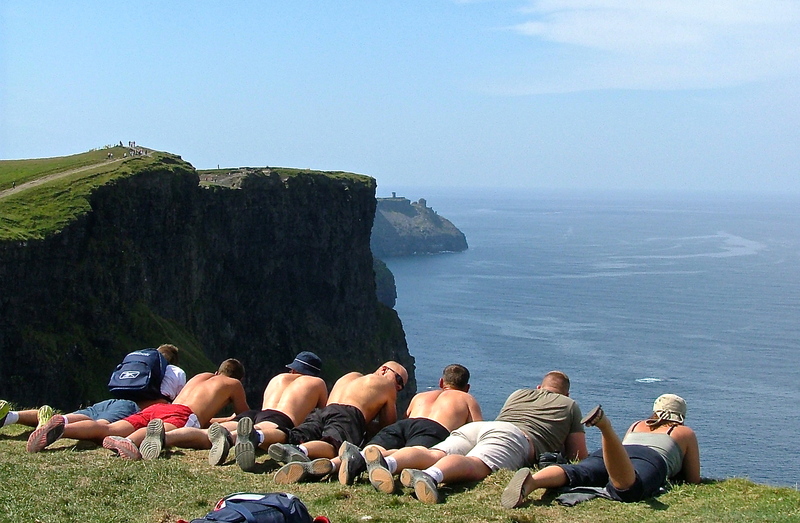 Lately I have been wondering if the Cliffs of Moher got the award they were looking for…. The “Modern/Other” Wonders of the World ? oh dear…..I was hoping !